Here's the second part of my Reading Around the World series. 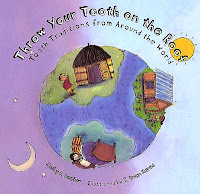 Throw Your Tooth on the Roof: Tooth Traditions from Around the World by Selby B. Beeler. Collecting tooth traditions from around the world, this book will be a hit with any who are waiting for a visit from the Tooth Fairy. Play with Us: 100 Games from Around the World by Oriol Ripoll. This book presents over 100 pages, both indoor and outdoor, played by kids in different countries all over the world. 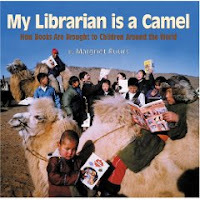 My Librarian is a Camel: How Books Are Brought to Children Around the World by Margriet Ruurs. Not everyone has a library nearby and this book shows how children all over the world receive library service. Some get books delivered by camel, others by boat, still others by van. How do you get your books? How Much? : Visiting Markets Around the World by Ted Lewin. From New Jersey to Egypt to Thailand, this book explores different markets all around the world. A Life Like Mine and A School Like Mine by DK Publishing. These books are filled with bright photos and lots of information about kids and schools around the world. See how different children play, work, and go to school in many different countries. World Team by Tim Vyner. 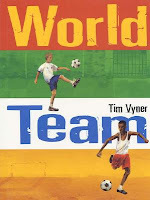 In this book, kids are engaging in a pastime that's common in many countries - soccer. Although the kids are growing up in many different places, they all have a dream to play in the World Cup. Wonderful Houses Around the World by Yoshio Komatsu. Take a peek inside different kinds of houses all over the globe. People by Peter Spier. This picture book has intricate pictures that kids will love poring over. Spier talks about the many different kinds of people all over the world - how we are all different and how we are all the same. These are just a select few of the many wonderful books that celebrate kids and people all around the world. What are your favorites? Check out the first installment of the list - Reading Around the World for Preschoolers. And happy Non-Fiction Monday! Tricia's got the round-up at The Miss Rumphius Effect! This is wonderful! Thanks for the great resources. What an interesting list. I'm especially interested in checking out Play with Us, 100 Games from Around the World. There are others, but they are on my bookshelf at school and I can't remember the exact titles!